Shelley made it clear that the creature would not long endure after the death of his maker, Victor Frankenstein. In fact, his words clearly show his intent to kill himself. It will be interesting to see how well I, Frankenstein picks up from this, if it does at all. From the descriptions given the creature, now named Adam, is still alive 200 years later. Did he decide against killing himself after making his final speech? Was the fire too painful to endure? Was he unable to die? These are just a few of the questions that spring to mind as I watch the movie trailer. On the one hand I am very much looking forward to this movie. The special effects look spectacular, plus I have a dark fondness for supernatural battles over the survival of humanity. I am always fascinated to see people wrestling with demons, whether those demons be literal or figurative. But as I am a great admirer of Mary Shelley’s original work I cringe slightly, anxious about how well her work will be honored. Will I, Frankenstein be more of a nod, or will we really be drawn into the idea that the creature she imbued with all the best and worst of humanity still exists, searching for his place in this world? 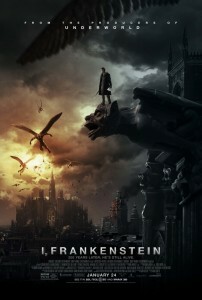 I, Frankenstein is opening in US theaters Friday, January 24, 2014. Will you be going to see it?